Approved by the FDA and recommended by the CDC, iOSAT is the first radiation protective tablet available to the general public. Experts agree that its prompt use would be the most effective measure available to protect millions of people who would be at risk in a nuclear accident or under a radiation threat from a terrorist nuclear weapon. 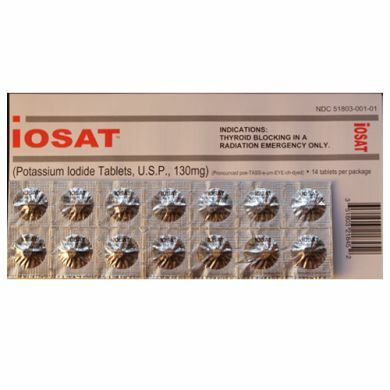 These FDA approved tablets contain potassium iodide (KI) which provides virtually complete protection from radioactive iodine (RAI), the contaminant that causes thyroid cancer. Should RAI ever escape, the health effects would be disastrous. Those at highest risk are infants and children, as well as pregnant and nursing females. According to the FDA, there are no other OTC (over the counter) drugs with the same active ingredient, strength and dosage form/route as iOSAT. "Thyroid cancer was the only prominent health problem to effect the general population. Although the accident released many types of radioactive isotopes to the environment, all of the injuries (to people located more than a few miles from the reactor) were limited to just the effects of radioactive iodine." Each packet contains 14 tablets of 130mg, individually foil sealed. Shelf life is 7 years. * POTASSIUM IODIDE SHOULD NOT BE USED BY PEOPLE ALLERGIC TO IODIDE. Keep out of reach of children. In case of overdose or allergic reaction, contact a physician or the public health authority. Read the accompanying labeling for precautions and side effects. provide. Products are sold as is and all sales are final.